We’d love your help. Let us know what’s wrong with this preview of The Greatest Salesman in the World by Og Mandino. What you are today is not important... for in this runaway bestseller you will l The Greatest Salesman in the World is a book that serves as a guide to a philosophy of salesmanship, and success, telling the story of Hafid, a poor camel boy who achieves a life of abundance. If Mandino's suggested reading structure is followed, it would take about 10 months to read the book. To ask other readers questions about The Greatest Salesman in the World, please sign up. where can I get a soft copy of this book ??? At first, I turned away from this book because of the title. I assumed it was a guide to exploitation and hoarding. Actually, it's a spiritual book. There's even a whole chapter on love. But throughout it is also about sales. Today I will multiply my value a hundredfold. A mulberry leaf touched with the genius of man becomes silk. A field of clay touched with the genius of man becomes a castle. A cyprus tree touched with the genius of man becomes a shrine. A cut of sheep's hair touched with At first, I turned away from this book because of the title. I assumed it was a guide to exploitation and hoarding. Actually, it's a spiritual book. There's even a whole chapter on love. But throughout it is also about sales. A cut of sheep's hair touched with the genius of man becomes raiment for a king. If it is possible for leaves and clay and wood and hair to have their value multiplied a hundred, yea a thousandfold by man, cannot I do the same with the clay which bears my name? I listened to the audio book and was surprised. I was expecting a high intensity instruction book on selling and closing the sale. As you all know, or should learn, is that The Greatest Salesman in the World is miles away from that perception. I am reading the first scroll now, and am on day 16. If you've read the book, you know what I'm talking about. If you haven't, you should. It's an easy read. It has the potential to change your life. Og Mandino’s The Greatest Salesman in the World starts off fairly harmless—in that vague, Paulo Coehlo’s The Alchemist self-help kind of way—but by the end, I found it rather detestable. 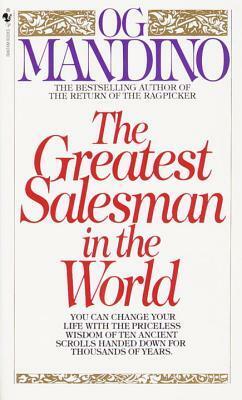 The Greatest Salesman in the World isn’t actually about sales; it’s more of a ‘secrets of success’ book. It centers in on Hafid, a wealthy old man who’s looking to give away his prized possession of 10 scrolls of successful salesmanship to a rightful heir. Each of these 10 scrolls contains a principle like “Pers Og Mandino’s The Greatest Salesman in the World starts off fairly harmless—in that vague, Paulo Coehlo’s The Alchemist self-help kind of way—but by the end, I found it rather detestable. The Greatest Salesman in the World isn’t actually about sales; it’s more of a ‘secrets of success’ book. It centers in on Hafid, a wealthy old man who’s looking to give away his prized possession of 10 scrolls of successful salesmanship to a rightful heir. Each of these 10 scrolls contains a principle like “Persist until you succeed” and yes, the short book winds up sharing each of these scrolls. It’s not quite as broad as allegory, but it’s still ambiguous enough that it’s an everyman’s guide to success. In many ways, you fill it in based on who you are—your challenges, your values, your goals—and that’s where I ran in to problems (so I’ll be ranting a wee bit long in this review). Late in the read, the Apostle Paul—yeah, Paul from the New Testament—shows up and gets these 10 secrets of success scrolls from Hafid. Now I didn’t pounce on the chapter about kinda sorta praying to an ambiguous God doing something somewhere—as I figured it was part of this catch-all, sell a million copies by being vague routine—but I’ll rip on this specific point: The inference is that the Apostle Paul ‘successfully’ spread the good news of Jesus because he was a great salesman who believed in himself, see? Not because God worked through him, but because Paul learned these 10 fancypants scrolls. Given that the Bible teaches that God wants people to get to know Him—and that, thankfully, isn’t based on any man’s work, good or shoddy—you can see how this effort message is a problem. But this is what irks me: The Greatest Salesman in the World is the type of nebulous philosophy book coated by ‘God wants you to be successful’ Christianity that I can see it being dreadfully popular in the western church. Sure, God cares about your desires and dreams and who He made you to be. Additionally, He not only likes hard work, He usually honors it (as covered by books in the Bible like Proverbs), but there’s more to the equation than just you. If you haven’t noticed, the world is a vast, messed up place full of questions, so if you make your faith all about how you can be really, really good at something, you’re likely missing what Jesus is all about. Hebrews 11 lists a bunch of faithful people in the Bible. It says a peculiar thing about them (listing verse 13 here, but verses 39-40 also cover it): “All these people were still living by faith when they died. They did not receive the things promised; they only saw them and welcomed them from a distance, admitting that they were foreigners and strangers on earth.” The point is, there was more than their desires, and even with things God promised them, they didn’t get them before they died. So if God didn’t give the things He promised to the people apparently on the right track in this life, why would He somehow guarantee the things that aren’t promised, like a successful business or a happy-go-lucky existence? Again, God likes hard work, a successful business can be a blessing, and yeah, The Greatest Salesman in the World advocates giving to the poor, but all of this is rather short sighted. Maybe if the book were less blunt in its Christian overtones I’d pass it off as that ‘vague sells’ point I’ve been harping on, but it’s specific enough on this aspect to be dangerous. For most people, they won’t view it that way, but when it comes to me and my review, I’m chucking Og Madnino’s philosophy far away. One star and boot across the room. Probably the most inspiring book i've ever read. This is written by a guy who had the most difficult life, as a travelling salesman, he experienced some serious difficulties and became an alcoholic, lost his wife and became homeless. He picked himself up, became a writer and achieved huge success. I was reading it at a very challenging time, when I was selling books door-to-door over a summer at University and I absorbed the principles of the book. It gave me motivation when I was struggling to co Probably the most inspiring book i've ever read. I was reading it at a very challenging time, when I was selling books door-to-door over a summer at University and I absorbed the principles of the book. It gave me motivation when I was struggling to continue knocking on doors. It helps one to develop all the character traits needed to be a success in any market. I read this book 25 years ago on a business trip to Chicago. Not beverage service, turbulence, nor a thunderstorm could get me to look up from it. I think I read it in a day. The flight attendant asked about it at the end of the flight. "That must be one very good book," she said. It is. Mandino gets pigeon-holed for being an "inspirational" writer, which takes in down a notch in some literary circles. It is a shame. He writes very gripping stories about the spritual truths that we all confront. WOW, only 110 pages but not one word was wasted. There is something about these older books that just blow my mind. It was in the 60's and written about B.C. time frame and the principles that were true in that time are still true today. "The secret", "Think and Grow Rich", "Rich Dad Poor Dad", and countless others teach a lot of the same concepts and they are all true!! If you vision it, if you are positive, if you act, if you keep trying, if you give back, ... it well come true. "Your desire t WOW, only 110 pages but not one word was wasted. There is something about these older books that just blow my mind. It was in the 60's and written about B.C. time frame and the principles that were true in that time are still true today. "The secret", "Think and Grow Rich", "Rich Dad Poor Dad", and countless others teach a lot of the same concepts and they are all true!! If you vision it, if you are positive, if you act, if you keep trying, if you give back, ... it well come true. 1. Today I begin a new life. 2. I will greet the day with love in my heart. 3. I will persist until I succeed. 4. I am nature's greatest miracle. 5. I will live this day as if is my last. 6. Today I will be master of my emotions. 7. I will laugh at the world. 8. Today I will multiply my value a hundredfold. 9. I will act now. 10. I will pray for guidance. Self-help books remind me of New Year's resolutions. It's good to have goals but the test comes in the follow-through. There are three books that I read on a yearly basis: "The Screwtape Letters" by C.S. Lewis, "A Christmas Carol" by Charles Dickens and "The Greatest Salesman in the World" by Og Mandino. As a profession, I am not a salesman. I have never really been a salesman. That's not the reason to read this book...although it will help you in that field. What this book does is show you simple steps to take to make important changes in your life to become "The Greatest ____________ in the World." (Fill in the There are three books that I read on a yearly basis: "The Screwtape Letters" by C.S. Lewis, "A Christmas Carol" by Charles Dickens and "The Greatest Salesman in the World" by Og Mandino. Like hearing a good rock band but being disappointed to learn they are a *Christian* rock band, I grooved to this book until the "Jesus" chorus. Thankfully, Mandino saved it for the last chapter, allowing the reader to get through the great messages and mantras without (depending on one's religious lean) feeling betrayed. Except for the Gospel lesson, this was a great and well-written story that will be like a reference book anytime I catch myself lacking courage, motivation, or laughter. Deep. Beautiful. Excellent. Containing the basic principles of life, simple but powerful, this short book can change a person's life if he applies these principles properly. I admired each word of the book, as I admire the author's biography and how he led his life through pain and misery to joy and success. Og Mandino's "The Greatest Salesman in the World"
Published in 1968 and still true today. The story is simple, yet fascinating. Mr. Mandino uses a wonderful tale to catch your attention, to teach and, in the end, to blow your mind. I will admit, I'm not the best at self-promoting. I didn't read this to find any "tips." I heard it was a "good read" by a friend who had just finished my book and thought I would like his style. What I found were truths that will help one through life. No surprises in Og Mandino's "The Greatest Salesman in the World"
What I found were truths that will help one through life. No surprises in revealing the 10 ways to change your life, but the surprise is revealed in the story. A friend gave me this book and I finished it in about an hour. Its short and to the point however the ritualistic requirements for the practices in the book is not really my cup of tea. This is one of those “fake it until you make it” type of personal growth books asking the reader to read one chapter/scroll 3 times a day for a month before going to the next chapter. It’s designed to be a meditative reflection on each principle to help you overcome obstacles in your life. The wisdom each scroll c A friend gave me this book and I finished it in about an hour. Its short and to the point however the ritualistic requirements for the practices in the book is not really my cup of tea. The wisdom each scroll contains is nothing new but perhaps we all need to sometimes be reminded that we are smart, capable and worthy of the things we desire in our lives and that bad times will always pass. A lot of the content feels a bit cliché and perhaps its because this book was published in 1968 and we have heard these words before in some guise or another. If self-development is of interest you may have read this classic already. An incredible story that contains anecdotes for success in it's pages. The author set the tone beginning with a storyline that sets up his opportunity to put forth 10 daily habits to encompass in your daily work. Then he closes the storyline with a beautiful ending tying it all together. Strangely enough I came to know about this book while reading a bio of Matthew Mcconaughey on IMDB, who is a famous actor that grew up in my small town of Longview Tx. He stated this book as being one of his insp An incredible story that contains anecdotes for success in it's pages. The author set the tone beginning with a storyline that sets up his opportunity to put forth 10 daily habits to encompass in your daily work. Then he closes the storyline with a beautiful ending tying it all together. It was one of the greatest book that ever read. I'm very excited about the story. The book wasn't only related to the sells. It also contains a lot of wisdom how to improve your life and how to become more excellent in everything you do. I will read that book every year ! Thank you Mr. Mandino. “The Greatest Salesman in the Wolrd” is a self-help classic from best-selling author Og Mandino. It’s a tiny book with some powerful principles, written in a compelling, clear style that makes for a quick read. It tells a story of Hafid’s journey from being a humble camel boy to the titular greatest salesman in the world. How his journey can also be yours. The main highlight of the book is the “The Ten Scrolls of Success” which the casual reader might think are piecemeal advises of different sales technique. What they contain are enduring principles on how to improve your life, how the world works and how you can overcome obstacles (real or imagined). Each scroll is designed as a meditation—daily affirmation—and to take full advantage, readers should take one chapter at a time and read it daily for a month before moving on to the next. More often, readers get involved with Mandino’s easy to read rhetoric and finish the entire book off in a single sitting—which I did. For the sake of those who hadn’t read or heard of this book, let me beg off from revealing what the scrolls teach. I feel as if it I write it here I might be depriving you of the exciting discovery that is yours to make. While it may seem a bit dated (it was published in 1968), the book still has some great concepts one may glean from it. This is a case of different strokes for different folks. The message is familiar to anyone who has read through self-help and success books, but is presented in a very simple format…and is primarily written for Christians. It’s an interesting read and its message is something one might ponder over at times, but it’s really not for people who are not willing to make positive changes in their attitudes or actions. If, however, you really think you can change your life, and that your success depends on your habits and attitudes, this book could start some very powerful changes. It won’t do the work for you, but could be a seed of positivity that begins some pretty great things for you. Mandino’s message: the individual determines the quality of his or her life. “Always strive to make the next hour better than this one." The Greatest Salesman in the World, written by Og Mandino, was one of his bestsellers, and sold over 50 million copies. The Fredrick Fell, Inc in Hollywood published it in January of 1968. Mandino was not always a writer. He used to work for the United States Army Air Corps. He flew for 30 bombing missions in Germany during World War II. He them became an insurance salesman because he realized that not many were hiring for bombing pilots. Mandino’s life soon went down hill because of alcoholism, but after his wife and child left him, he went to the library and ended up reading hundreds of books about success. There was a library in Concord, NH where he found himself reading W. Clement Stone’s, Success Through a Positive Mental Attitude, which changed his life for the better. Soon after, Og Mandino then became a very successful writer. Germany, salesman, and success all refer to his book because they helped to form The Greatest Salesman in the World. In Germany, Paul has been chosen to become the greatest salesman in the world. He has been working for Hafid, who was the greatest salesman, but now he has to take over for him. How would you feel if you were working for the president, and then asked to take over a whole country for him? Then the whole country rested in your hands, and counted on the decisions that you make. Paul agreed to the throne, but first he must go through the rules and challenges of becoming a great salesman. He is then sent off on a spiritual journey in Damascus, reads the ten scrolls, and faces many obstacles both good and bad to take on the full throne. I really enjoyed the book. It was a very spiritual book because Paul must ask for God’s help to help him with his journey. The book made me feel like I was actually there with Paul, and because I was able to real the rules that he had to follow, they made me think of ways to become a better person. In each scroll that he read, there was a powerful message that not only related to him, but me also, and could also relate to others if they have the chance to read it. It isn’t a very suspenseful book, but it drives you to want to know what happens next after he has read the scrolls, and returns back home to seen if he has earned the throne. If you are not a person who does not believe in God, or a higher power, then I do not recommend this book to you. In almost every chapter, Og Mandino relates to God, and how you must count on him to fulfill your accomplishments. All in all, the book was very interesting, intriguing, and helpful to my knowledge. I had resisted reading this book (seemed too trendy at the time to be relevant) until I had my first "commission only" job. The book did not provide me with closing techniques, prospecting methods, or anything that might immediately help me feed my wife and 6 month old. It did, however, provide me with something infinitely much better...hope! That is hard to quantify, but without it...all is lost. I used the inspiration of this book to become a student of sales and service. I have had great success in sales and now write my own sales books - The Sales Crumbs Trilogy - that are inspiration and instructional. They have been compared to this title often but go more into the contemporary challenges of a sales person going from struggle to success. Yes, I was inspired to engage a parable style approach due, in no small part, to this work by Og Mandino. If you are in sales and love to quote "Glengarry Glen Ross" then this may not be a book for you. Recommends it for: absolutely read this book! Fabulous book that I have read so many times that I have lost count. Each time I read it, I read it the way it is meant to be read, staying on each "scroll" chapter for 30 days, before moving onto the next chapter, thus taking ten months to read the book. I try to live my life by the amazing tenets handed down for centuries in these ten scrolls. If we all lived by these tenets our world would be a much more loving, peaceful, and wonder-filled place to live. THIS THE MOST INSPIRATIONAL BOOK I HAVE EVER READ. THANKS OG! seek delivery of gold, love, good health, petty victories, fame, success, or happiness. I've read this book many, many times. Every time I read it, it's like the first time I read it. Although no book gives greater direction for life than the Bible, this one is incredibly lovely and helpful. It was a gift from my mom when I was younger. She told me to dwell in it's instructions. It's just a beautiful read. I've given it as a Christmas gifts to numerous friends and they've all echoed my sentiments. If you'd like to read it, let me know, and I'll buy you a copy! I selected this book based on the recommendation of a respected colleague. I thought it was going to be just another book on how to sell. When I read the first sentence, I knew that my expectations were wrong. While this book may improve your sales, its greater message is on how to live your life so that you will be successful. If this has piqued your curiosity at all, get a copy and read it. It's short and only takes about 2 hours to read, so do it soon. This motivational "PMA" book is a re-read for me. While I may not agree with all the minor theories mentioned in passing, the overall premises that you and I were created for a purpose; that each of us has value;' that we all need encouragement, goals, and to fulfill said purpose are good ones. The ultimately positive message is also a help when I am having difficulty with depression. This book went straight into my personal favorites of all time. It's extremely motivational and will inspire you to take action to achieve your goals. I cannot recommend it enough. Don't let the title fool you, the book is not just about sales. The topic is more about general success and the 10 lessons presented in the book are evergreen wisdom. I highly recommend you to check out this book! Og Mandino was the editor of Success Magazine for many years. I wish he had spent that time writing more books. The Greatest Salesman in The World is one of the most enjoyable self-help books I've ever read. Couldn't finish reading the book. The first part is just to put on irrelevant makeup to the main contents of the books. The pieces of advice on the paper rolls were written out as some illusory doctrines that get out of my head every minute. Maybe I'm not suitable for this self-help style. The story is that of a very successful merchant (Hafid), who's success entailed from applying the wisdom contained in ancient scrolls that were passed onto him. These scrolls contain the foundational principles of success for a salesman. What is worth noting is that these same principles apply just as equally to leadership. The story is very motivational, inspirational, entertaining and educational. 1) "Truly many times The story is that of a very successful merchant (Hafid), who's success entailed from applying the wisdom contained in ancient scrolls that were passed onto him. These scrolls contain the foundational principles of success for a salesman. What is worth noting is that these same principles apply just as equally to leadership. 1) "Truly many times have you heard me say that the rewards are great if one succeeds but the rewards are great only because so few succeed. Many succumb to despair and fail without realizing that they already possess all the tools needed to acquire great wealth. Many others face each obstacle in their path with fear and doubt and consider them as enemies when, in truth, these obstructions are friends and helpers. Obstacles are necessary for success because in selling, as in all careers of importance, victory comes only after many struggles and countless defeats. Yet each struggle, each defeat, sharpens your skills and strengths, your courage and your endurance, your ability and your confidence and thus each obstacle is a comrade-in-arms forcing you to become better...or quit." 2) "Failure will never overtake me if my determination to succeed is strong enough." 3) "In truth, the only difference between those who have failed and those who have succeeded lies in the difference of their habits. Good habits are the unlocked door to failure. Thus, the first law I will obey, which precedeth all others is - I will form good habits and become their slave." 4) "If I have no other qualities I can succeed with love alone. Without it I will fail though I possess all the knowledge and skills of the world." 5) "Nor will I allow yesterday's success to lull me into today's complacency, for this is the great foundation of failure. I will forget the happenings of the day that is gone, whether they were good or bad, and greet the new sun with confidence that this will be the best day of my life." 6) "Each minute of today will be more fruitful than hours of yesterday. My last must be my best." 7) "From this moment I am prepared to control whatever personality awakes in me each day. I will master my moods through positive action and when I master my moods I will control my destiny." 8) "To enjoy success I must have happiness, and laughter will be the maiden who serves me." 9) "Today I will surpass every action which I performed yesterday. I will climb today's mountain to the utmost of my ability yet tomorrow I will climb higher than today, and the next will be higher than tomorrow. To surpass the deeds of others is unimportant; to surpass my own deeds is all." Augustine "Og" Mandino II (December 12, 1923 – September 3, 1996) was an American author. He wrote the bestselling book The Greatest Salesman in the World. His books have sold over 50 million copies and have been translated into over twenty-five different languages. He was the president of Success Unlimited magazine until 1976 and is an inductee of the National Speakers Association's Hall Of Fame. Augustine "Og" Mandino II (December 12, 1923 – September 3, 1996) was an American author. He wrote the bestselling book The Greatest Salesman in the World. His books have sold over 50 million copies and have been translated into over twenty-five different languages. He was the president of Success Unlimited magazine until 1976 and is an inductee of the National Speakers Association's Hall Of Fame.